DES MOINES - Baseball returns to Des Moines in 21 days with the I-Cubs' home opener slated for Tuesday, April 9 with a 6:38 p.m. first pitch vs. New Orleans. To kick off the season, Iowa will host its annual Spring Open House on Saturday, April 6 from 10 a.m. - 2 p.m. Principal Park will be open to the public for the event with free parking and admission. Fans can tour the entire ballpark including the press box, home clubhouse, and dugouts (weather permitting). 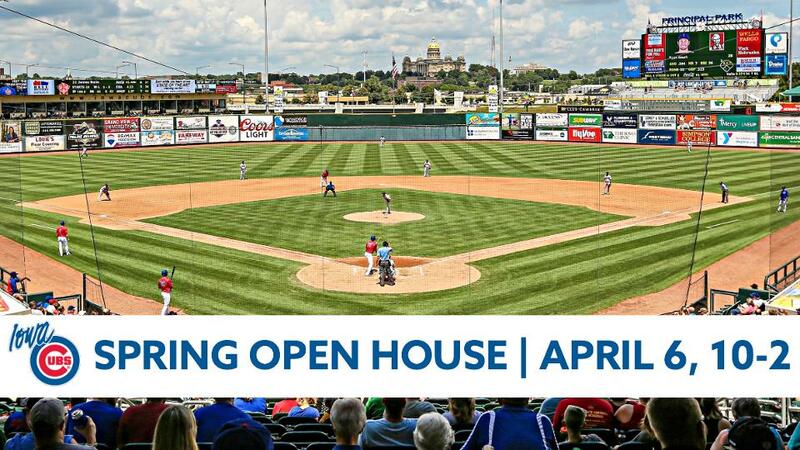 Each attendee will receive a free hot dog and a small drink at the event, as well as a General Admission voucher redeemable for one ticket to any April game or admission for two on Opening Day. Information regarding the upcoming season, including ticket and promotional details, can be found on www.iowacubs.com.